Phillip White wrote an interesting article the other day on proposed changes to relax rules in South Australia regarding the transport of grape harvesters and other machinery and equipment from Victoria to South Australia, provided that they have come from a “phylloxera exclusion zone”. For those unacquainted with phylloxera, it is the insect that laid waste to most of the Victorian wine industry in the nineteenth century principally by feeding on the roots of the vitis vinifera vine (the introduced European vine responsible for quality wine). It also laid waste to most of Europe’s wine industry around the same time, including practically all of France’s vineyards. The principal cure has been to graft the vitis vinifera to American vine rootstocks which confer phylloxera resistance. Such is the phylloxera’s longevity and tenacity, and resistance to chemical control, that it remains with us today. The primary form of management for non-phylloxera infested areas has been to quarantine infested regions from non-infested regions. 1. Phylloxera Exclusion Zones (“PEZ“): areas which are declared free of the insect. 2. Phylloxera Infested Zones (“PIZ“): areas where phylloxera has been detected. 3. Phylloxera Risk Zones (“PRZ“): areas that have an undetermined phylloxera status. It is not entirely clear to me the distinction between a phylloxera “control zone”, and a phylloxera “risk zone” per the map. But it is interesting to note, as highlighted in Phillip White’s article, the proximity between the Western Phylloxera Exclusion Zone and nearby Phylloxera Infested Zones. Relaxing transport controls in this circumstance – even just looking at the map alone – seems somewhat eyebrow raising. Phylloxera entered Victoria in the nineteenth century through the port of Geelong, so that area is I expect not unsuitable for the phylloxera either. Victoria also received a reminder of the tenacity of the insect when the previously phylloxera free Yarra Valley was discovered to have phylloxera in 2006. A fresh outbreak was confirmed by the Yarra Valley Wine Growers Assocation in 2010. Hopefully, the science and methodology in support of any relaxation is right. The stakes are however high. Even today, one occasionally reads of tastings of pre and post phylloxera Bordeaux wines, with the question hanging: were the pre phylloxera wines, from vines planted on their own roots, better? I hope that this question remains unasked for South Australia’s wines. The phylloxera appears both patient and hardy. It seems it can only be countered through similar means. Eyebrow raising indeed. The potential gains hardly outweigh the potential risks. 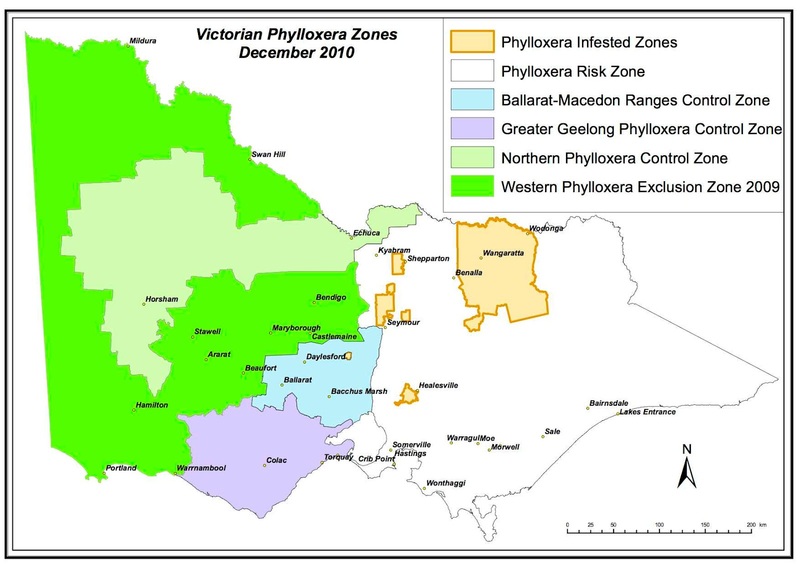 Given that the Yarra Valley was previously phylloxera free, it would appear that the current restrictions have failed to prevent phylloxera spreading within Victoria. The argument for easing those restrictions should be considered in that context. That's a very good point regarding the Yarra Valley: whatever the control was, the evidence proves it didn't work. Bendigo is an interesting one too, being an example of an area that was in fact phylloxera infested in the nineteenth century, so much so that the vines were ordered to be pulled out. In 2009, Bendigo was declared phylloxera free, following an extensive survey and so is in the PEZ. All I can say is let's all hope they are right.